The process of evolution can be very slow, and it allows living creatures to develop an anatomy that is structured for them to thrive. 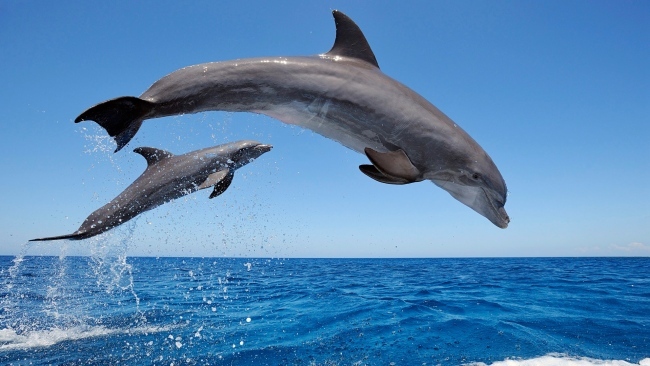 Dolphins have ancestral connections to terrestrial mammals. There is much research to indicate that this is with the Artiodactyl order and it is believed that the ancestors of dolphins that we know and love today entered the water about 50 million years ago! There are many telling signs that the dolphin is related to terrestrial origins. The fact that they need to come to the surface of the water to get air is the most dominant factor. Researchers have carefully examined the bones of the fins for dolphins. What they find is that they strongly resemble the limbs of many animals that live on land. Dolphins have spines that move vertically, and this is a characteristic mainly found in animals that are able to run on land. When you look at the movements of fish, their spines move horizontally. The size and the shape of the skull has changed over time too. It has become larger which is an indication that the development of the fat pad in the lower jaw emerged. 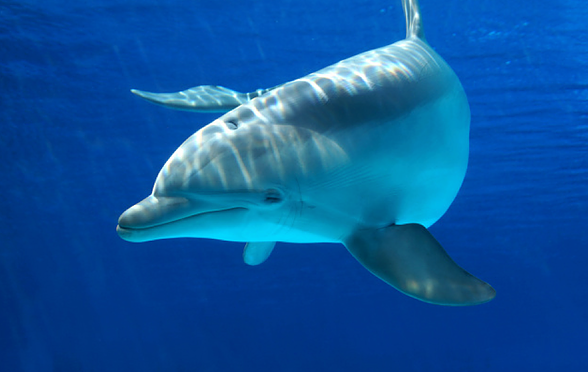 It extends to the middle ear and this helps dolphins to be able to hear as well as to use the process of echolocation. It is believed that during the early Miocene period, the use of echolocation was developed in the form that dolphins rely on it today. The early dolphins were smaller and believed to have consumed small fish as well as various organisms in the water. The older theory is that the evolution was of whales and they came from ancestors of hoofed land animals that were very similar to wolves and even toed ungulates. The animals had teeth that were triangular, similar to those of whales. However, the new evidence draws away from that theory and offers information that the whales would be closer related to hippopotamus and their ancestors. Those that argue this point out that the ancestors of hippopotamus were not been in the fossil record until more than 1 million years after the first known ancestor of the whale; Pakicetus. The most recent information about the Pakicetus, shows us that whales aren’t ancestors of mesonychids. Instead, they are artiodactyls and it is believed when they split from the mesonychids is when the process of living in the water started to occur. What is interesting though is that, unlike many other mammals, they didn’t change to being herbivores. Instead, they continued to be carnivorous in the water as they would have been on land. What was once outwardly seen of the whale hind parts are now smaller and they are also internalised. However, sometimes there is the development of mini legs called atavism and that is believed to be the result of a genetic code that will call for longer extremities to form. Another change was that the nasal openings moved from the end of the snout to the top of the skull area. This is what is referred to as nasal drift. Those nostrils later evolved into blowholes so that they can get to the surface of the water, take in air, and then submerge themselves again with ease. The movement of the ears closer to the eyes is also part of the evolution process. Very interesting changes over time to help them survive in their environment in the water only and not on land as before due to ancestral links. There are plenty of questions that still linger about the evolution process for dolphins. The good news though is that some of the evidence that has been located gives a better idea of what really occurred. It has also helped to add some support to various theories that still have to be tested and proven. Some of the fossil remains found in Pakistan in the 1970s identify some of the different changes that took place for the anatomy of the dolphin. The current process of evolution could be slowly changing the limbs of the dolphin. Some embryos have been spotted with hind limb buds that will develop close to the base of the fluke, which is the tail. They are about 1 inch long. The modern body of the dolphin does show two small pelvic bones that are rod shaped. Yet these limbs aren’t really shown on the outside. However, in 2006, a Bottlenose Dolphin was found in Japan that featured these small fins on each side of the body. While a great deal more of research is necessary, it is possible that what is being witnessed is the slow movement of evolution for the body of dolphins taking place. Only time will tell if that is what occurs and if these hind limb buds start to be visually present on future generations of offspring. 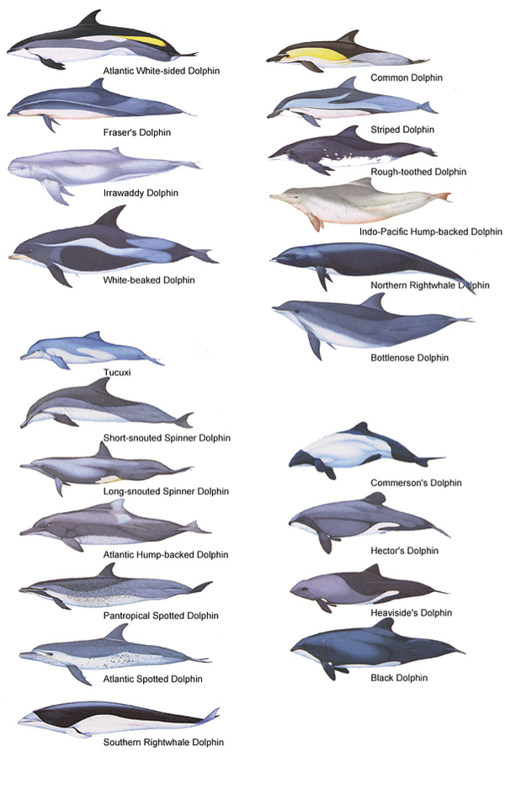 There are 43 species of dolphins worldwide, 38 types of marine dolphins, and 5 river dolphins. Dolphins live mainly in saltwater such as the oceans but some of them live in freshwater. Scientists have divided bottlenose dolphins into two ecotypes, or varieties: coastal and offshore. Coastal bottlenose dolphins enjoy warm, shallow waters and have smaller bodies with larger flippers, presumably for better manoeuvrability. Bottlenose dolphins living within 4.65 miles of shore are classified as coastal dolphins. Different species have very different DNA codes which differentiate them from each other far more than researchers had originally believed. Studies also indicate that there are differences among the skull size and shape of dolphin’s heads. Slight variations have been noticed, such as having a curved dorsal fin instead of straight and changes to the snout. The type of dolphin you will see in a given area depends on environmental factors such as enough food and the temperature. Dolphins also migrate at different times of year. The most well known and loved of all dolphin species is the Bottlenose Dolphin, the one most often seen in books, movies, and when you visit an aquarium. They are very intelligent, easy to train, and they are more likely to approach humans in the wild than other species. They are attractive because they always seem to be smiling. This is due to the curved element on their face that turns upward on both sides as when a human is smiling. This is a large sized dolphin with a body size ranging from 10 feet (3m) to 14 feet (4.2m) long. They can weigh up to 1,100 pounds (499kg). The average length though is 6 ½ feet(1.99m) to 12 feet (3.6m) and the average weight is from 330 pounds (149kg) to 440 pounds (199kg). The overall size will vary based on their location. Studies show those that live in cooler bodies of water are larger than those living in the warmer temperatures. The body of the Bottlenose Dolphin is very sleek and it is streamlined to help them move through the water with ease. They have skin that is smooth is it feels like rubber when you touch it. They don’t have any sweat glands or hair on the body. The outer layer of the skin is anywhere from 10 to 20 times thicker than that of terrestrial mammals. live in freshwater, and they are found in a variety of rivers around South America and Asia. They are smaller than most dolphins; with an average size of about 8 feet (2.4m) when fully mature. They can be various colours too including brown, grey, or black. is harder to spot out because they prefer the deeper locations. They can weigh about 350 pounds (158kg) and measure about 8 ½ feet(2.6m) long. They have a small head and feature a long beak, but lack the common crease on the melon that other dolphins have. has a square shaped head and no teeth in the upper jaw but they have several peg like teeth on the bottom jaw. They are frequently found in captivity on display because they thrive in such an environment. has blue and white stripes on the body. This species is believed to have the highest population as well as the biggest overall distribution of that population. is an acrobat! People love to see them perform both in the wild and when they have been trained in captivity. is very simple in design, but also very respected in the early cultures and there is evidence that this species dates back to Greek and Roman times. tend to live in water that is cooler than the temperatures for other species of dolphins. They can be found along the coastal regions as well. 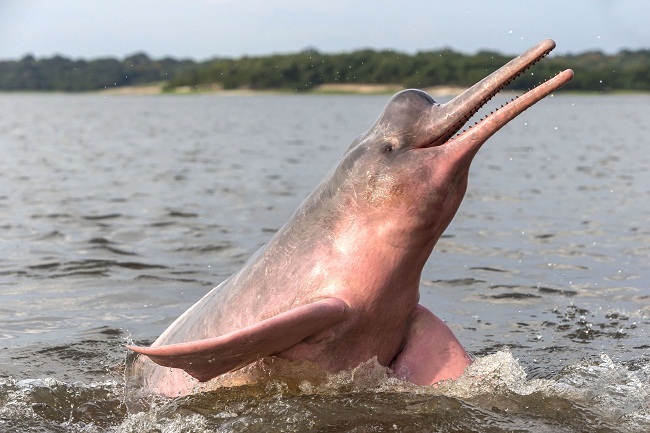 is believed to be the most powerful of the dolphins due to their size and their strength. They can take down seals effortlessly. In 2011, a new dolphin’s species was found in Big City Harbor around Australia using DNA coding. The Burrunan Dolphin is believed to be only in two areas at this time. There are about 100 of them in Port Phillip Bay around Melbourne and about 50 more of them 100 miles away in the coastal lakes of Gippsland. can weigh up to 5,000 pounds(2267kg) and be up to 24 feet (7.3m) long. They are believed to be the most social of the dolphin species, they are also very vulnerable to pollution in their habitat.